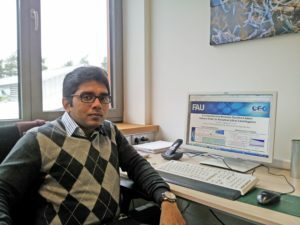 Dr. Thajudeen got the prestigious Alexander von Humboldt research fellowship to carry out his postdoctoral research at FAU. He joined the Institute of Particle Technology in January, 2014 after completing his PhD at the University of Minnesota, USA. Nanoparticles, with characteristic sizes below 100 nm, are widely used in many applications due to their excellent product properties. The final properties are often dependent on the shape of the particles as well. While there are excellent theories and techniques available to characterize spherical nanoparticles dispersed in liquid and gas phases, further understanding is required for characterizing non-spherical nanoparticles. With this objective, Dr. Thajudeen aims to extend the capabilities of current characterizing techniques to measure the sizes and properties of non-spherical particles, specifically focusing on nanorods and fractal aggregates. What was it that got you interested in your field? I should thank my PhD advisor (Dr. Christopher J Hogan) for that. Aerosols and nanoparticles were a totally alien research field for me, as I was looking for possible research areas to carry out my doctoral studies. His sheer passion for research and enthusiasm has had a positive influence on me. Could you give us a short description of the project that your research group is working on? Nanoparticles (with characteristic sizes less than 100 nanometers) find use in more applications due to their excellent product properties. The final product properties depend heavily on the size as well as the shape of the particles. It is easier to characterize spherical particles (defined by the radius) compared to non-spherical particles. Currently we are working on predicting the sizes of non-spherical nanoparticles dispersed in liquid and gas phases, without resorting to microscopy techniques. I work mostly on computer simulations, trying to study the physics of non-spherical nanoparticles. There are established theories regarding the formation and properties of spherical nanoparticles; however the effect of particle shape has not been dealt with very effectively. Characterizing nanoparticles is a vital step which determines the final product properties in many of the applications. Accurate analysis would go a long way in helping us correlate shape and size of particles to the desired effects, resulting in better applications for nanomaterials. I am pretty impressed by the extent of collaboration between different research groups at the University. I find this quite helpful as you get well qualified opinions and suggestions from researchers who are experts in their field. How well known internationally is FAU in your field of research? The chemical engineering department is quite well known internationally. I had cited a few publications from the research group of my current advisor while pursuing my doctoral studies. It was a pretty straightforward decision for me to join a successful research group. It is rather amazing to see the breadth of research being carried out here at the moment. What would you say to students or young researchers who are considering whether they should choose FAU for a stay abroad? I would definitely encourage them to consider that option. The research environment is pretty good here. Erlangen is also an easy city for a foreigner to settle in. What were your first and later impressions of the Erlangen-Nuremberg region? Green, clean, simple and peaceful. These impressions haven’t changed much during the course of my stay. I have a quite picturesque view of Erlangen and Europakanal from my balcony. Do you already have a particular highlight, an experience or a moment during your stay so far, that you’ll remember for a long time? I wore my Manchester United jersey to watch the first leg of the Champions league quarter finals (Manchester United vs. Bayern Munich) in 2014 in a pub along with my German colleagues (most of them from Bavaria). Needless to say, there were very few supporting United. Quite shockingly, United got the lead and there was stunned silence all around. This was the moment for me to wave the United flag. I wouldn’t forget that day for a very long time!! My excitement was cut short as Bayern scored the equalizer pretty soon. What is your favourite place at FAU? ‘Hotspot’ near our department (LFG). On cold days this is the best spot to be in. The glasses on the windows and doors reflect the sun’s rays which seem to converge in this area.